‘During the search of the detained Ukrainian naval boats, a document was found on board the Nikopol vessel … that contains direct orders to make a secret passage from Odessa to Berdyansk, with focus on covert approach to and navigation through the Kerch Strait’, the FSB said in a statement. On Sunday 25.11.2018, two Ukrainian gunboats and a tug crossed the Russian maritime border, ignoring Russia’s lawful demand to stop. The vessels were seized and the Russian Foreign Ministry said that Kiev’s actions were a provocation coordinated with the US and the EU, adding that Moscow would suppress any attempts to challenge its sovereignty and security. 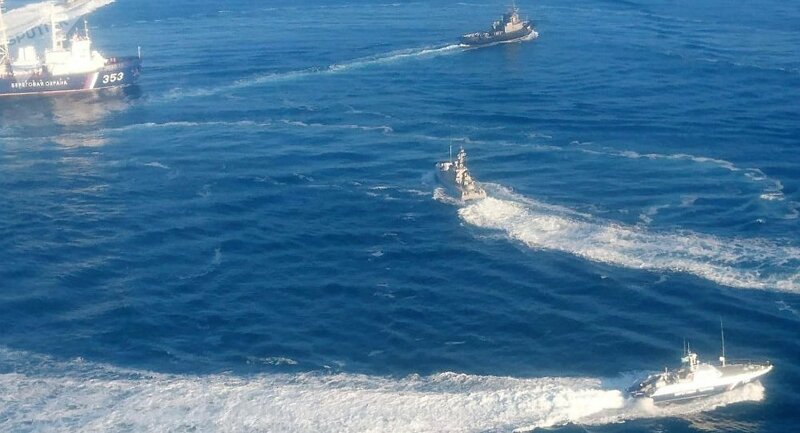 According to Russia’s Federal Security Service (FSB), the vessels sailed toward the Kerch Strait, an entrance to the Sea of Azov, where the ships were seized by Russia due to the lack of reply to the lawful demand to stop. The following day, the Ukrainian authorities introduced martial law in selected regions of Ukraine along the border with Russia as well as along the coast of the Black Sea and the Sea of Azov for 30 days.